The major one-day conference reviewed the critical issues relating to the development of new anti-infectives and the endemic problem of antimicrobial resistance. Derek Butler, Chair of MRSA Action UK presented “A Patient’s View” and was followed by Lord Jim O’Neill, who led the Government’s review on tackling the global problem of antimicrobial resistance, and gave the keynote address. The opening of the address began with a film on antimicrobial resistance, in which members of MRSA Action UK, Derek Butler and Maria Cann featured. Derek Butler presented the "Future of Infection Control, Hearts and Minds" at the Association of Healthcare Cleaning Professionals' study day. In his book "Mirage of Health" the respected French microbiologist Rene Dubos wrote, "Since the days of the cave man, the earth has never been a garden of Eden but a valley of decision where resilience is essential to survival. To grow up in the midst of danger is the fate of the human race" in the face of microbes it has been one of survival and danger. Derek spoke of the Maidstone and Tunbridge Wells scandal in 2007 where 90 patients died and the Mid Staffordshire Scandal where there were 1,200 Deaths between 2005-2008. During this period families affected by healthcare associated infections were campaigning with MRSA Action UK to bring about change and became stakeholders in the Department of Health’s cleaner hospitals campaign and the WHO Cleanyourhands campaign. He recounted the stories of families' personal experiences and the legacy of getting infection prevention and control wrong, leaving the impact like ripples in a pond. Delegates heard stories regarding patients as young as 17 years old, the loss of a young mother and her baby and how this had spurred the families on to bring change. We need to focus efforts on prevention and hygiene in the healthcare environment was a key component to preventing infections, and the burgeoning impact of antimicrobial resistance for our children and grandchildren. He asked delegates to remember, that nothing matters until it becomes personal, and all that is necessary for the harm of patients, is that good people like you do nothing. 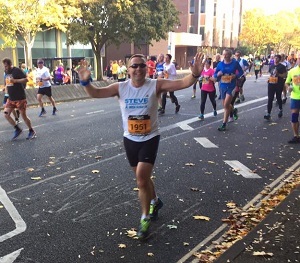 Steve ran the Great South Run on October 23rd in the autumn sunshine. The 10 mile run took him through the sights of Southsea and Portsmouth past HMS Victory, Spinnaker Tower and views of the Isle of Wight. 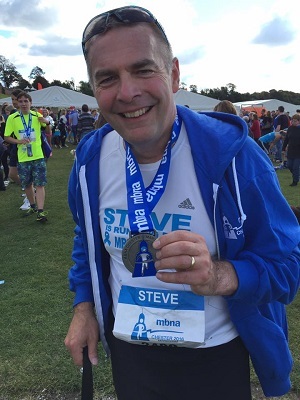 This was certainly a victory for you Steve, finishing in a time of 01:26:37. Jules was there to support him, but still resting from running due to a back injury. Get well soon Jules and congratulations Steve. 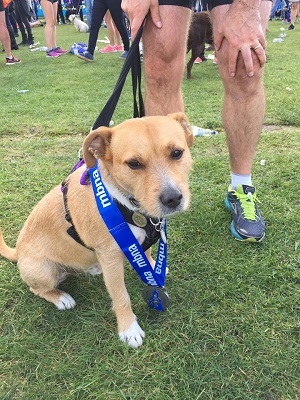 Jules and Steve kicked off MRSA Awareness Month October in Chester, along with Ted their cute little terrier. Jules was there to cheer Steve on in the Chester Marathon. 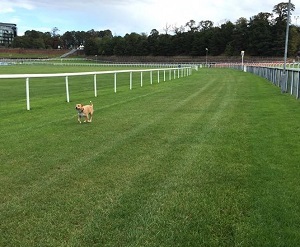 The grueling run started at Chester Racecourse (Ted thinks he would be good at this too!). Jules commented "He did it! I'm so proud of him the last 10k was a struggle but he was determined to finish with a smile on his face and is very very happy with 04:29:00"
A huge thank you Steve and congratulations on completing the Chester Marathon. At the end of September we were contacted by Hayleigh Proctor who lost her uncle Colin to MRSA. 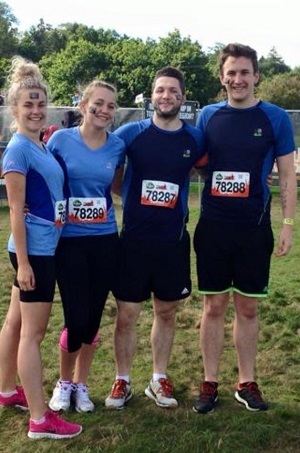 Hayleigh let us know that she would be joining friends to run the Tough Mudder on the 25th September, and had decided to donate the proceeds they raised to MRSA action UK. The IPS annual conference attracts over 800 professionals and we hope you are one of those who take the opportunity to attend in 2016. Provision of an exceptional educational programme each year has led to the development and expansion of the IPS Conference encouraging a larger and more varied audience. The audience is not only growing significantly in numbers, it is also changing in delegate profile and includes DIPCs, Microbiologists, Antibiotic Pharmacists, Managers as well as nursing leaders in Infection Prevention and Control. MRSA Action UK attended again this year, promoting World MRSA Day. Professor Didiet Pittet of the World Health Organisation, launched his documentary film "Adapt to Adopt" which followed his global journey in the quest to reach healthcare professionals and communities to adapt behaviours and make hand hygiene central to caring. This included helping poorer countries adapt systems to make alcohol hand-rub and teach effective techniques to prevent and control infection. He did a book signing at the launch and thanked MRSA Action UK personally, whose Chair, Derek Butler featured in the film, for their contribution to patient safety. Derek Butler chaired the Knowlex Infection Control 2016 conference in Manchester. Knowlex (shorthand for ‘Knowledge Exchange’) is an organisation that has been set up with the ambition of disseminating information on research and innovative practice to help healthcare professionals in their working lives. Knowlex's objective is to help all organisations involved in health – Acute trusts, CCGs, and local authorities – to become more efficient and effective in delivering better outcomes for the public. The centrepiece of the organisation's efforts will be conferences, where professionals can meet and discuss the challenges they are facing, along with exchanging the knowledge that can help them to make improvements. An on-going supplementary programme of webinars and roundtables will support these conferences. The Future of Infection Prevention and Control Conference, hosted expert speakers from government, healthcare, academia and the private sector presenting their views on how to address the threat of antimicrobial resistance. Topics covered included how antimicrobial resistance is spread, how ‘superbugs’ could decrease the effectiveness of modern medicine and what action can be taken to combat antimicrobial resistance before it is too late. Derek Butler attended to present the view from patients who had been affected, changing their lives forever. The 2016 event delivered two informative days with networking opportunities. With the ongoing pressures to deliver more for less, the 2016 conference theme, Healthcare Cleaning, Delivering Under Pressure, gave colleagues the opportunity to share knowledge and best practice. Derek Butler attended to give the patient perspective and received a generous donation from the AHCP, who nominated MRSA Action UK as recipients funds raised by a raffle with prizes donated by sponsors of the event. If the world doesn't take action now, superbugs will kill someone every three seconds within a generation. That's the stark warning from a global study into antibiotics, which says we're overusing them and failing to develop enough new ones. The report says in future, basic procedures we take for granted could become too dangerous to carry out. Derek Butler, Chair of MRSA Action UK, attended to present 'The Future of Infection Prevention & Control' delivering key messages for staff, featuring patient stories. MRSA Action UK Vice Chair Helen Bronstein attended the second meeting of the All-Party Parliamentary Group (APPG) for Patient Safety, chaired by Andrea Jenkyns MP. This followed the successful launch of Andrea Jenkyns MP's hand hygiene campaign. Ben Gummer MP, Parliamentary Under-Secretary of State for Care Quality told the APPG further culture change within the NHS is required to improve patient safety and reduce infections, he warned that while there is a growing energy to put patient safety front and centre of the NHS, much more still needs to be done. The Minister gave examples of good practice that demonstrated how a culture shift with a clear focus on patient safety and boosting staff satisfaction can lead to enhanced care quality and efficiency in NHS Trusts. The APPG heard from Dr Mike Durkin, Director of Patient Safety at NHS England, who emphasised a need for greater transparency across the NHS. Dr Durkin said that the NHS must be an organisation that is constantly learning, and one that places the needs of patients and their families at its core. More…. Hand Hygiene is the foundation of all good healthcare, everyone involved in caring for patients has a responsibility to clean their hands at the right time, every time. The consequences of getting it wrong are too great for the patient and ultimately for society. Any avoidable infection is one too many, it may prove impossible to treat if antibiotics are no longer effective. So please don’t be accountable for avoidable infections. Join MRSA Action UK in supporting HandZ and make patient care the first priority and to be as safe as it can be. Handz aims to educate young people about why hand hygiene is important. At the launch members of parliament are invited to take information away for distribution in primary schools. Jennifer Adams Infection Prevention and Control Nurse invited Derek Butler to speak at the Cheshire & Wirral Partnership NHS Foundation Trust IPC Study Day after hearing Derek present earlier this year. Derek Butler, Chair of MRSA Action UK, presented "Hearts and Minds" speaking about the effects avoidable healthcare associated infections have on patients and their families and how things can be so different if we follow some simple basic rules on infection prevention and control. The presentation told the stories of many who had been lost and how if the staff caring for them had done things differently the outcomes could have been so different for the patient and their families. More…. Derek Butler addressed some 50 to 60 Link nurses at the infection prevention & control study day showing that good infection prevention and control can reduce the risk of patients contracting avoidable healthcare associated infections and that one avoidable infection was one too many. More…. Derek Butler was invited to attend a roundtable discussion on improving infection prevention and control and antimicrobial management within the NHS. Attendees included a range of stakeholders relevant to the debate including policymakers, commissioners, regulators and patient representatives. At the meeting several topics were highlighted for discussion, these were, incentives for the development of new antimicrobials, funding for new antimicrobials, new technologies to prevent infections, the collection of infection data and how to share and disseminate this data, medical education and training and sharing best practice. More…. The late Doctor Patricia Jevons viewed the micro-organism under the microscope for the first time 55 years ago on 2nd October 1960 in a Laboratory in Colindale, London. Outbreaks followed in hospitals in the South East and MRSA was soon endemic in hospitals across the UK and then became pandemic spreading across the globe. Dr Jevons discovery was published in the British Medical Journal on January 14th 1961, acknowledging the significance of the find and its evolution, believed to from a patient’s skin lesion tested in the previous July. Derek Butler, Chair of MRSA Action UK was interviewed by Channel 5 News and on BBC Radio London giving our viewpoint and spoke about the impact of antimicrobial resistance on families in the reports. Derek Butler delivered a leading address at The Future of Infection Prevention and Control Conference 2015, which took place on Wednesday 8 July 2015, at the University of Salford, Manchester. Derek's presentation showed the human cost of acquiring avoidable healthcare associated infections, and also drew on knowledge from other industries to highlight how systems thinking and human performance can be applied in healthcare to make patient care safer. This was also a feature in other speakers' presentations. The shared aim of all healthcare professionals is to reduce the risk of harm from healthcare-associated infections for patients, staff and visitors; and to reduce the costs associated with preventable infection. In July 2014 David Cameron announced a package of measures to take antimicrobial resistance, including an independent commission looking at the issue led by economist Jim O’Neill. "Resistance to antibiotics is now a very real and worrying threat, as bacteria mutate to become immune to their effects," said Cameron. "With some 25,000 people a year already dying from infections resistant to antibiotic drugs in Europe alone, this is not some distant threat but something happening right now. If we fail to act, we are looking at an almost unthinkable scenario where antibiotics no longer work and we are cast back into the dark ages of medicine where treatable infections and injuries will kill once again." The latest event in the Reducing HCAIs series of conferences, Combating Pervasive Threats explored the greatest infection risks challenging healthcare providers today. Delegates learned about the threats on the horizon and how the best performers in their fields of expertise were tackling the problems. Delegates from MRSA Action UK attended the event and would like to thank GovToday for the opportunity to speak about their work with the James Lind Alliance Priority Setting Partnership, identifying future research into preventing healthcare associated infections and antimicrobial resistance. 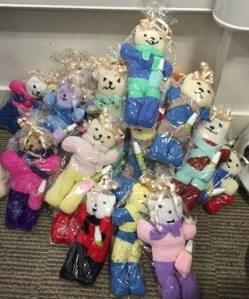 Our thanks go to the ladies at Winifred Dell Care Home for making teddies to raise funds for MRSA Action UK. Jules Owen is offering these cute teddies for a suggested donation of £2 to friends and colleagues. Each teddy has a hand wash spray, so the message about hand hygiene in helping to protect us from infections is clear - it's always good to have clean hands to stave off things like tummy bugs and flu, not just for the care setting! These cute bears are irresistible. Thanks ladies, and thanks Jules yet again! During our visit it was encouraging to see the attention given to infection prevention and control in the community setting, particularly in light of the vulnerable people that Abacare Care Agency look after. We were impressed with the week-long induction training programme, covering the essentials of care, dignity and respect. 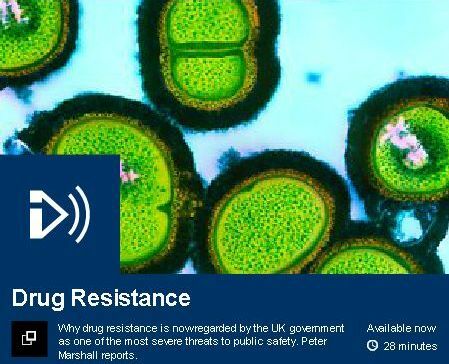 Why drug resistance is now regarded by the UK government as one of the most severe threats to public safety. Peter Marshall reports. With growing problems with antimicrobial resistance, reductions in Clostridium difficile disease stalling at around 20,000 recorded cases a year, and 14,000 Staph bloodstream infections a year – the micro-organism involved in the evolution of MRSA - MRSA Action UK calls for cross-party support in "Healthcare Infections a Manifesto 2015"
We knew they would do it. Jules smashed it in 04:00:09, just ahead of Steve who did a fantastic run in 04:07:50, we saw you on TV Steve! They have raised £5,288.96. 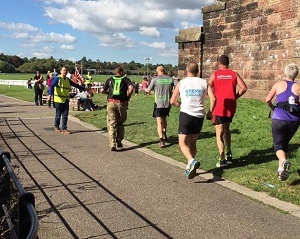 We thank everyone who kindly donated and cheered them on. 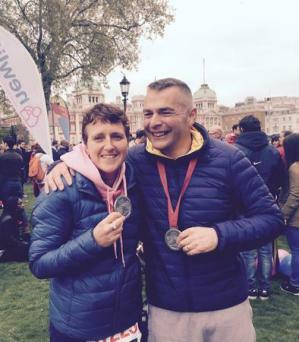 They have now clocked up 1,640 race miles between them (without the training). They are truly amazing! Our colleague and friend in the USA Jeanine Thomas is working on some new programs for the MRSA Survivors' Network - encouraging youth involvement and exploring the possibility of producing a documentary on MRSA. Jeanine is aiming to introduce a Bill for universal screening for MRSA at a federal level. Jeanine will be hosting the 7th Annual World MRSA Day Kickoff event on Saturday, September 26th 2015 in Chicago. 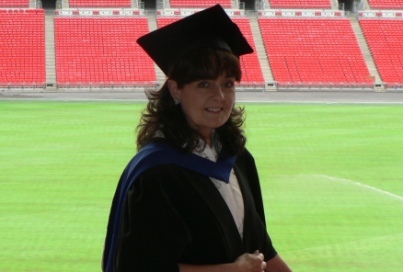 Her events will coincide with our awareness raising throughout October and on World MRSA Day itself, October 2nd, we will be at the annual Infection Prevention Society Conference in Liverpool, where we will be promoting awareness with colleagues from across healthcare who are experts in infection prevention and control.